The 12′ trampoline offered by Skywalker is a must consideration for those that are very concerned with price and quality. The 12′ is a nice entry-level trampoline at the lower end of the trampoline price spectrum yet without sacrificing quality. Because this is a 12′ trampoline, it is still considered a full-sized trampoline, yet the smallest of the category allowing it to fit in almost any backyard. 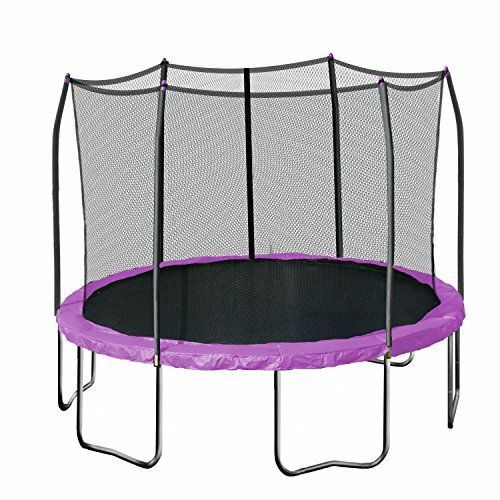 Due to the price point, this is one of the more popular trampolines that we have reviewed. Additionally, this is a smaller trampoline, with a diameter of 12′ it is much easier to fit is yards that don’t have an abundance of space. With a round trampoline the bounce will be less. Again with a standard (as opposed to a springfree trampoline) there are always concerns of frame injuries. Some previous buyers have had issues with assembly. Net attaches to springs (as opposed to pad), a difference from the larger Skywalker trampolines. Q: Will I need a spring puller? A: No, the spring puller is included in the shipping items. Q: What is the assembled size? Q: Can I detach the proactive netting? A: Yes, the enclosure netting can be removed.